North Jakarta Fire Handling and Rescue Sub-dept. formed Environment Fire Safety System (SKKL) at fishermen village RW 09, Kalibaru Urban Village, Cilincing Sub-district.
" Thus we form SKKL for prevention"
North Jakarta Fire Handling and Rescue Sub-dept. Head, Satriadi Gunawan said, RW 09 of Kalibaru Urban Village area is included as prone to fire RW area. It is a densely populated and most of house materials are made of wood and bamboo which are flammable. "There were fire cases at four RTs in RW 09 area within 2010. Thus we form SKKL for prevention," he said, Monday (7/31). 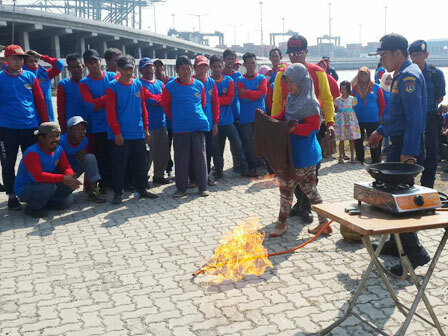 In this activity, participants were trained to handle fire on fire stove. Fire extinguisher and portable pump were used to extinguish the fire. Kalibaru RW 09 Head, Daroni hopes, RW 09 will be free from fire threat through SKKL. "By forming SKKL, hopefully it could minimize fire cases in our area," he stated.